As reluctant as I am to use the term “soup” to describe aash, for fear of undermining its significant position within Iranian cuisine and culture, I nevertheless find a comparison between the two the most efficient way to describe the dish to new appetites. To this end, aash could be said to be an “honorable soup”–rich, thick and laborious to prepare. Depending on the type of aash, it is made of specific varieties of herbs, vegetables, fruits, grains and dairy products; with or without beef or lamb. 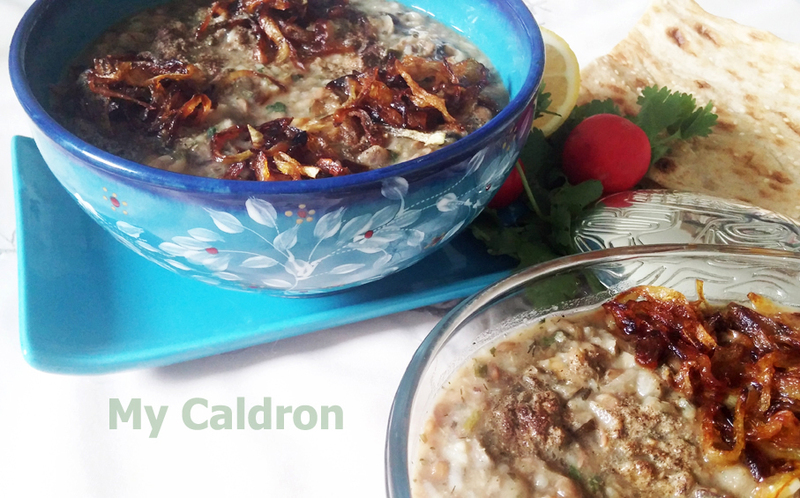 As with most Iranian dishes, certain types of aash are very much region specific. 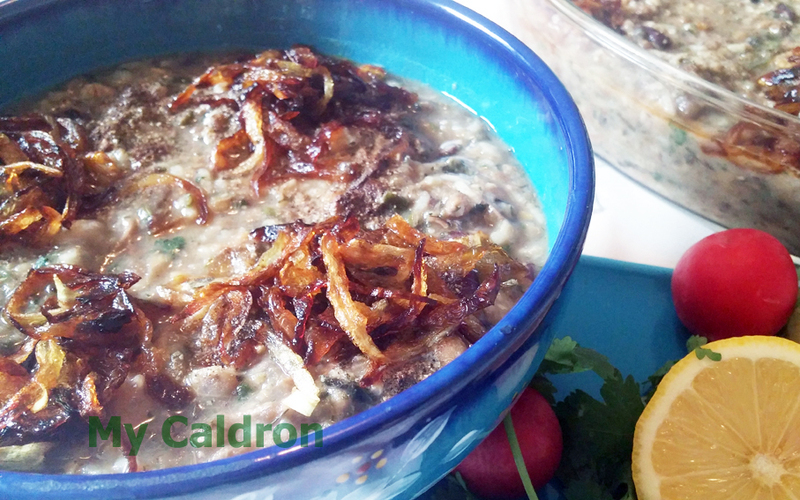 Cucumber aash, for example, is famous only among the Malayer in the Hamadan province, while milk aash is specific to the Khorasan province. On the other hand, aash-e reshteh–typically made with fresh herbs, three types of beans, Iranian noodles and a thick whey called kashk–is known to all Iranians inside and outside the country. Most types of aash are fairly simple to prepare and are routinely cooked as a side-dish or the main meal for lunch or dinner, especially during long, cold, winter nights. Meanwhile, some types of aash (the most popular ones in fact) could be quite elaborate, requiring a lot of preparation time and a considerable degree of diligence in the tending garnishing stages. These types of aash are usually made collectively and shared with neighbors, friends and the poor on specific occasions such as when a vow has been made (aash-e nazri), or a happy event is being celebrated. From as far back as I can remember until my late teenage years back in my old hometown Shiraz, we had one such vow aash event at home. 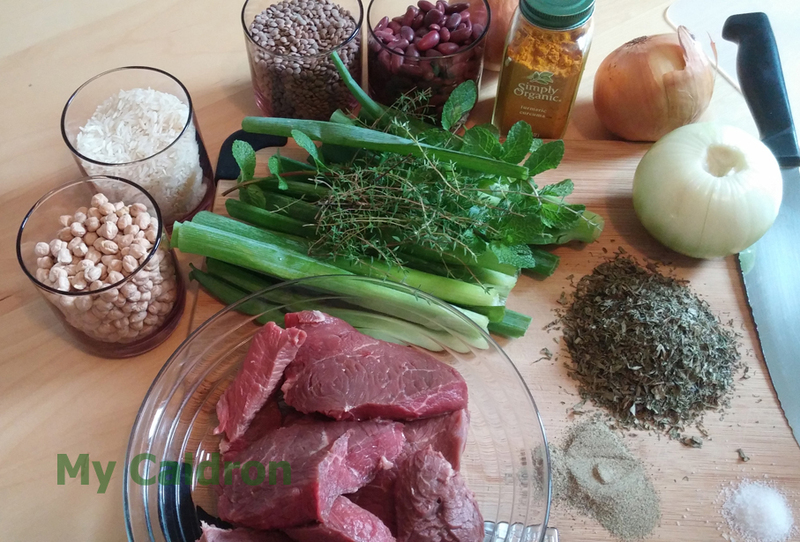 Ours was an aash sabzi Shirazi that featured lamb, beans and herbs. It was made each year on the day that marks the passing of the Prophet Mohammad in the Islamic calendar, to give out as a way to pay off the vow that my grandmother had once made in gratitude for my father’s health. Everything about the aash-cooking event electrified me so much that I couldn’t sleep properly for several nights before it. The preparation would start a week in advance with the booking of a professional cook, specializing in aash-making, and the launching of the shopping-cleaning-washing cycle. Some years, my father would buy a sheep for the cook to butcher at home, thereby making the best possible use of its parts. Other years, he would just buy the necessary meat and bone to be sorted by the cook. Whether it was to kill the beast or just sort and chop bought meat, the cook would settle down in the yard and wield his blade masterfully. He would then hose down our two pots, specifically reserved for the occasion, one of which I could sit in until I was fourteen. He washed and soaked the beans, minced the already picked and washed herbs, peeled and sliced a mound of onion without using any kind of cutting board–all the while sipping his tea and taking bites of the food the adults offered him. The cut onions were soon turned into a golden crispy type of fried onions which resembled a delicious delicacy in itself. It was not until after dusk that the cook actually started cooking. He stayed up all night to tend to the aash while almost everyone else slept for a few hours. I was particularly mesmerized by the night when the cooking was moved outdoors to the rear, dark end of our yard over two stand-alone, gas burners. In those years, my brother and I always kept the cook company until dawn as he smoked the night away under the yellow lamp that dangled from a temporary extension cord over his cooking pots. By 4:00 a.m., as daylight deepened and the aash was ready to be served, the cook hit the road with a sizable casserole of aash for himself, letting the array of my father’s fans–friends and relatives–take over the serving and distribution. Aash was then carried inside in large containers to rows of china and glass bowls of different shapes and sizes lined up on the kitchen countertop. These were then filled, decorated with fried onions and sent out to different destinations before people had their breakfast. The collective aash distribution that followed the long night of cooking was noisy, messy, fun, exhausting and–at times–chaotic. Aash bowls filled tactfully just below the brim were carried on foot or in cars; individually or in groups of three or four set on a tray. The empty bowls were always rapidly washed, dried, returned and reused for the next dispatch. Young and old, each family member had a list of their friends to be served early morning aash. 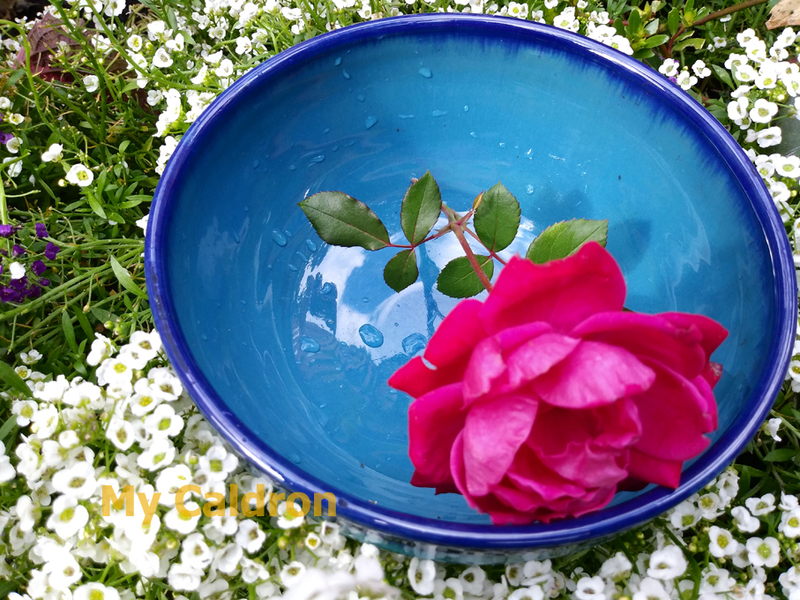 The more prestigious friends and older relatives were to be given the nicest bowls, ideally the white chinaware decorated with a red rose design. At this final stage of the aash ritual, I usually got the role of delivery girl, which I found quite boring as soon as I finished my own list of friends. My older brothers or sisters, however, were given a more rewarding role. They sat next to my dad in the back of a pickup truck along with a large pot of aash, a ladle and several melamine bowls. The driver was instructed to stop at construction sites, orphanages, mosques or anywhere else where a delicious and unexpected breakfast was most likely to be appreciated. Upon delivering stomach-warming bowls of aash to houses in those early morning hours, we always receive a good-will wish of “May your request be granted!”; we also often received the washed bowl along with a branch of fragrant, curly, pink roses, unromantically called Mohammadi, a small bunch of violets or marvels-of-Peru, or a fistful of jasmine flowers hurriedly plucked up from the yard’s flowerbed. When no flowers were in season or in the garden, a single scented, leathery, green leaf of the sour-orange tree did the job just as delicately. Strangely enough, I had never tried cooking the good old ash sabzi shiriazi at home before. With the Montreal’s beautiful autumn arriving this year, I just felt the desire to seek the recipe for this nostalgic aash and try it. So, I called up a few friends, skimmed through several recipes and tried it out a couple of times before I was able to renew the familiar tastes and smells of the aash safely hidden in the recesses of my sensory memory all these years. 1 cup chives and tarragon or dried “sabzi for aash” purchased from Iranian store near you. 2 cup of fresh or frozen chives and parsley. You can always replace chives with green part of Scallion. 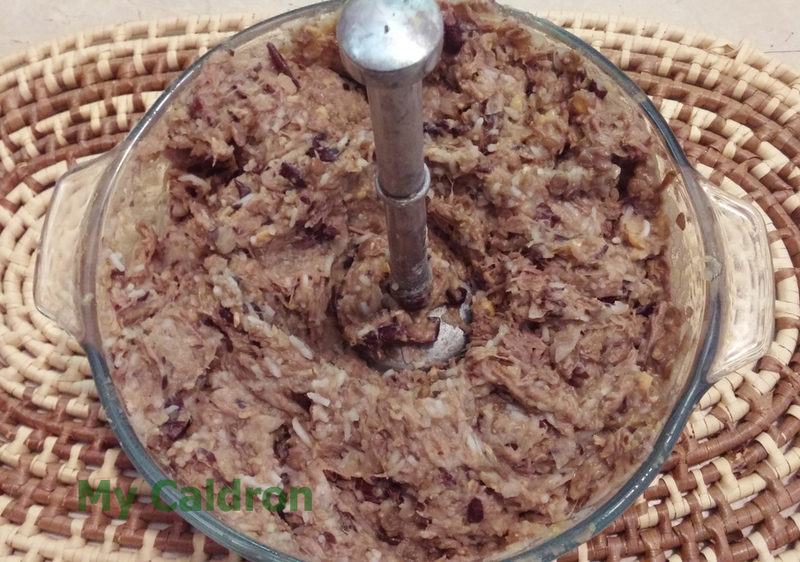 Soak chick-peas and kidney beans overnight (or about 5 hours), changing the water a few times. Discard the water, and using fresh water and a pinch of salt cook the two beans in separate pots as they have different cooking times. Stir frequently. Wash and rinse lentil and rice. Cook in separate pots with a pinch of salt. Stir frequently. 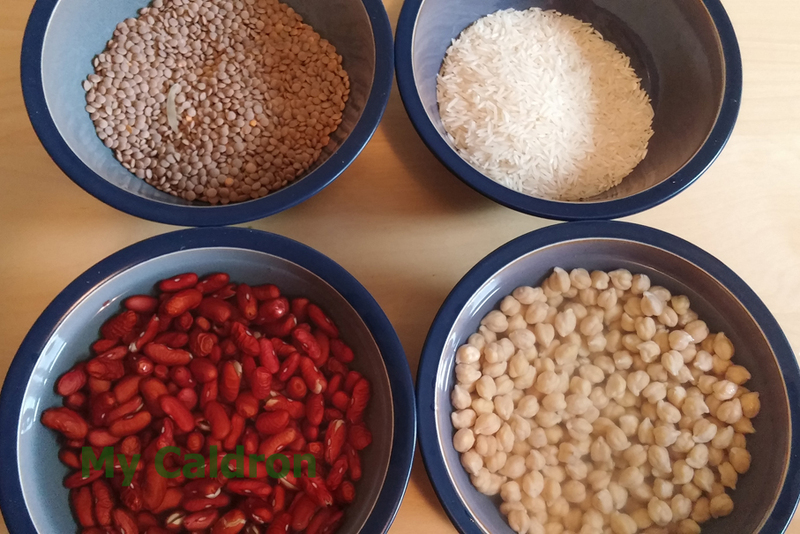 Keep the water in the beans’ pots if there is any left at the end of cooking process. In a large pot, place meat chunks, 1 onion cut into quarters, 1 teaspoon turmeric. ½ teaspoon salt and ½ teaspoon pepper. Sauté briefly for 1-2 minutes then add about 4 cups lukewarm water. Close the lid and bring to boil then reduce the heat and cook over medium heat until the meat is thoroughly cooked. You could throw in one bay leaf if you do not like the smell of the lamb shanks being cooked. While the meat is being cooked get busy with fried onions. 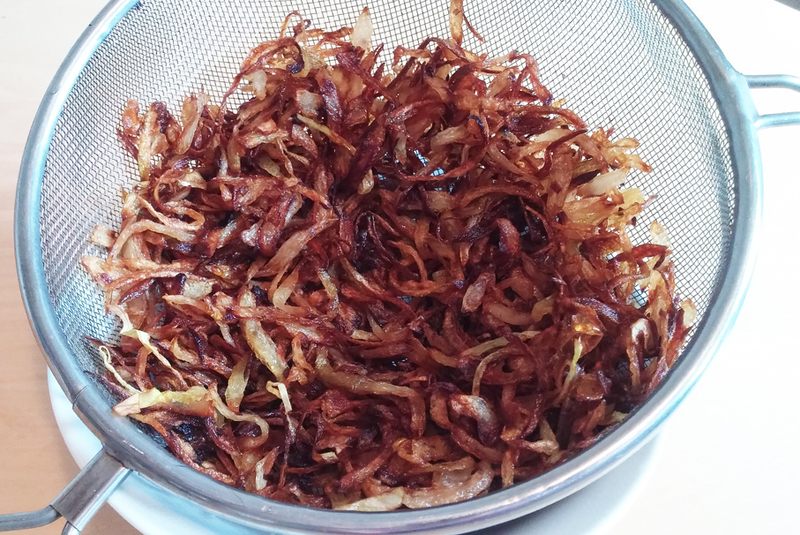 We need the golden crunchy type of fried onion (piaz daagh) used for garnish: Slice 2 white onions extra thin in equal lengths and fry them in a lot of hot oil in a frying pan. Fry them over low heat in small batches. Each thin slice of onion should be apart from any other in the cooking oil, almost swimming in it. Keep tossing and flipping them and after a while you will note that they are turning crisp and golden. Note that the friend onions will continue getting darker after removed from the heat; therefore, you would need to remove them from the heat before they are completely golden. Once you get the desired color, spread in to fine mesh basket and let cool. Once the lamb shank is cooked, drain content of the pot through a large sieve. Remove the cooked onions and bay leaf, if you used one. Using a spatula, take out all the meat chunks and place in a bowl. In the same way, take out half the amount of cooked cheek-peas, beans, lentil and rice and add them on the top of the meat. Now, you could either use an electric mixer or a manual masher to mash everything well. Cut two more onions in regular (medium size) thickness and length. Wash and dry the pot and put it back on the stove. Heat 2 tbsp. oil and add the cut onions and fry until they are soft and translucent. Add the meat broth, as well as the beans and rice along with whatever juice you still have in those pots. Taste to adjust the seasoning. You would need to slow cook your aash for at least 2 hours and at the end of the process get a well-blended aash with little broth left in it (image below). 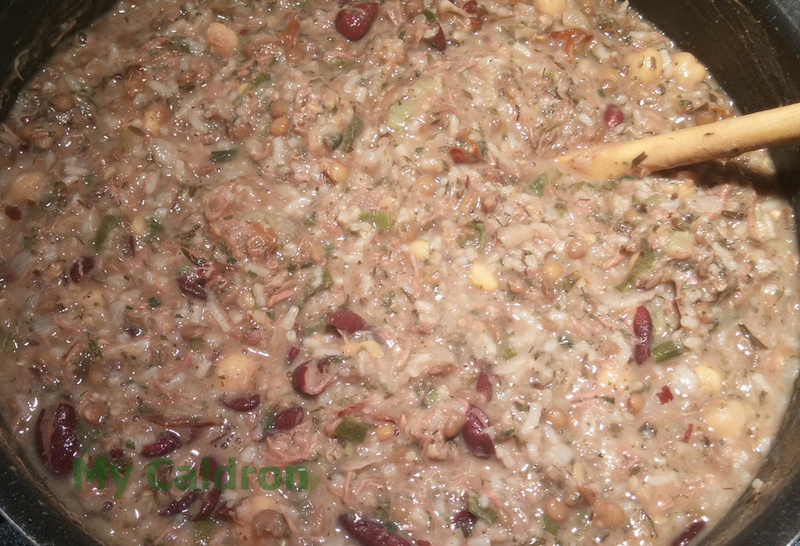 If the remaining broth and beans’ juice is not enough to see the aash through the 2 hours of slow cooking, add more lukewarm water in the beginning of the cooking process. Stir every 10-15 minutes. Serve aash sabzi Shirazi hot in small bowls topped with lots of crispy fried and some black powdered pepper if you like extra hot. Serve with sangak flat bread and a touch of fresh lemon or lime juice as breakfast or as a main or side dish during the day! Noosh-e jaan!